A well loved casserole of ground beef, and I like to also add smoked sausage, seasoned with sweet onion and bell pepper and a cream soup sauce and topped with crispy, crunchy tater tot potatoes and cheese. Tater tots. Little pillows of deep fried shredded potatoes. I mean, c'mon... how can you not love those little bite sized crunchy bites of goodness? On the rare occasion that we eat Sonic, I guarantee I'm gettin' the tater tots y'all! Did you know that tater tots were born out of trying to "use it up?" They sure were. Those folks at Ore-Ida were looking for a way to use up the leftover slivers of potatoes and came up with the tater tot. You'd almost think those Griggs brothers were southerners! Around since the early 50s, we consume about 70 million pounds of tater tots a year. 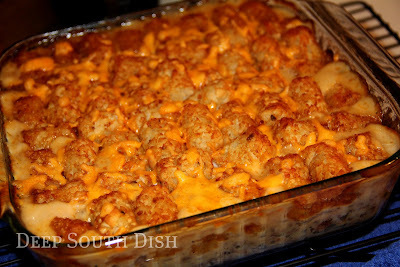 Ah yes... and let us not forget the fabulous famous Tater Tot Casserole! Sometimes called Cowboy Casseroles, it's a recipe I'm pretty sure every southerner has in their recipe box. The basic tater tot casserole is very simple, including cream of something soup, cheese, milk or sometimes sour cream, seasoned simply with a bit of salt and pepper, and is usually served as a side dish. Somebody along the way thought to add meat to make it a more substantial main dish, usually ground beef or turkey. Some folks layer the ground beef in the bottom of the casserole raw, but I prefer to pre-cook mine and drain off the fat. Well, y'all know I can never leave well enough alone, right? Just one thing to note here with this casserole. A lot of people mix all of the ingredients together, others put the tater tots on the bottom and pour the mixture on top of them. Well, in my little ole humble opinion, you want those tater tots to be crispy on top, really you do! This ain't hash brown casserole y'all, although that is an excellent variation. I put the meat mixture on the bottom, top that with a little bit of cheese, pour the soup mixture over that and arrange the tater tots on top. Bake that uncovered and in the last five minutes, sprinkle just a bit of cheese on top and return to the oven to melt the cheese. I've also included some of the many variations this casserole has gone through over the years, just in case you may want to try something a little different. Perfect for toting to a potluck, but I wrote this in a smaller version here for a 9 x 9 inch baking dish, so you'll want to double it for that. For more of my favorite casseroles and bakes, visit my page on Pinterest! Add olive oil to a large skillet and saute the onion and bell pepper until softened but not browned, about 5 minutes. Stir in the ground beef and brown; drain if needed and return to the skillet. Add the minced garlic, cook and stir another minute. Add in the chopped smoked sausage and cook about 3 minutes. Stir in the basil, thyme, Cajun seasoning; taste and add salt and pepper only as needed. Transfer meat mixture to the prepared casserole dish and sprinkle with 1/4 cup of the cheddar cheese. Evenly pour the soup mixture over the top. Arrange the tater tots on top and bake uncovered at 350 for 45 minutes to 1 hour, or until potatoes are nicely browned and crisp. Sprinkle the remaining 1/4 cup of shredded cheese on top and return to the oven just until cheese is melted. Serve immediately with a green vegetable or a mixed garden salad. Double for a 9 x 13 inch casserole. Cook's Notes: I used Savoie's 7-links spicy hot smoked sausage this time, so I eliminated the Cajun seasoning but added in 1/4 teaspoon of garlic powder. Okay to use lower fat products. Substitute cooked and crumbled bacon for the sausage. Bacon Ranch Tater Tot Casserole: Prepare as for classic casserole, stirring in one packet of dry ranch dressing mix in with the soup mixture and adding in 4 slices of cooked and crumbled bacon. Assemble and bake as above. Bacon Cheeseburger Tater Tot Casserole: Prepare as for classic casserole, except substitute condensed cheddar cheese soup for the cream soup and mix with one cup of sour cream, omit sausage and adding in 4 slices of cooked and crumbled bacon. Assemble and bake as above. Sloppy Joe Tater Tot Casserole: Prepare as for classic casserole except substitute one can of sloppy joe sauce (like Manwich) for the cream soup and water or beef broth for the milk. Assemble and bake as above. BBQ Beef Tater Tot Casserole: Prepare as above, except substitute 1 cup barbecue sauce and 1 can undrained Rotel style diced tomatoes for the cream soup and milk. Season meat with 1/2 teaspoon cumin, 1/2 teaspoon paprika and 1 teaspoon chili powder. Add a can of drained Mexican style corn, if desired. Taco Tater Tot Casserole: Prepare as above, except substitute 1/3 cup water, 1 small can diced green chilies and 1 cup salsa or 1 can drained Rotel style diced tomatoes for the cream soup and milk. May also use a can of red enchilada sauce for the salsa or tomatoes. Omit sausage and season ground beef with 1 packet dry taco seasoning, or a homemade substitute. May also stir in 1 can of drained and rinsed, pinto or black beans and/or a can of drained Mexican style corn, if desired. Before serving, garnish with shredded lettuce, chopped avocado, sliced jalapeno, chopped tomatoes, shredded Mexican style cheese, sliced black olives, sliced green onion, chopped raw sweet onion, chopped fresh cilantro and/or other desired taco toppings. Serve with sour cream and salsa at the table. Veggie Tater Tot Casserole: Add a layer of vegetables (about 1 cup) thawed if frozen, drained if canned. Good choices are green beans, peas, corn and mixed vegetables. Assemble and bake as above. Breakfast Tater Tot Casserole: Substitute a 1 pound roll of cooked, crumbled hot breakfast sausage (like Jimmy Dean) and 4 slices of cooked crumbled bacon for the ground beef/smoked sausage. Omit cream soup and beat 1 cup of milk with 4 large eggs. Assemble and bake as above. Classic Tater Tot Casserole: Omit meats and increase shredded cheese to 1 cup, stirring 1/2 cup into the soup mixture along with 1 cup of sour cream. Add tater tots to casserole dish, pouring soup mixture on top. Top with remaining cheese. Beef and Sausage Hash Brown Casserole: Substitute a small bag of frozen, shredded hash brown potatoes, thawed, layering half of them in the bottom of the casserole dish. Prepare meat mixture as above and pour over the top, adding the remaining hash browns to the top of the casserole. Bake as above. I'm sure this will be a favorite with my grandkids -- well, actually ALL of us. All my favorite ingredients. By the way, we had John's Pot Roast for Mother's Day dinner tonight. It was a HUGE hit. Everyone agreed it was the best roast EVER and that the "gravy" was delicious on both the potatoes and the meat. I can't wait to try this also as a stew. A new family favorite. Thanks!!!! We are contributors to those who eat tater tots although not as much lately. The casserole sounds delicious. Joanne over at Eats Well With Others mentioned them for use as the potato crust in a quiche, which I plan to try soon. we just ate this casserole this weekend except I have never used smoked sausage in it and that just sounds yummy! It makes me hungry just reading about it. I will definitely be making this for our next office pot luck. Thanks! Love tater tot casserole. I haven't had one in forever though it seems. Always made my nanny make it for me when I come home but now I guess i need to start doing it myself! I haven't made this for ages Mary, but it almost always turns up at our church potluck dinners. Then I eat my fill. The addition of sausage sounds yummy, and the tots must be on top. Gotta have it crunchy! ohmygosh, it's been years since I've thought about this one and MAN is it good. This casserole sounds great. Our less amazing version is known at my house as "Student Casserole," since it can be made with three cheap ingredients -- tots, soup, and hamburger. Water, thank heaven, is still free. Love to see an old classic tarted up a bit. I WOULD LOVE TO WIN THIS. I TOO AM FROM MISSISSIPPI. LOVE THE SOUTH!!! Whoah...that looks like comfort food at its finest! I love your blog and have found many new recipes that I have tried and love. I am a cookbook fanatic and would love to have this cookbook. I used to make tater tot casserole, when my daughter was home and am going to try it again on my grandkids. I used to put a can of mixed vegetables in it too. I made a tater tot casserole a while back after stumbling upon it in a cookbook. Being from southern CALIFORNIA and not necessarily the SOUTH, everyone thought I was out of my mind! But they all ended up loving it. You have inspired me to make it again and mix it up. That's usually the reaction to some of our southern dishes Kristin, but then once people get a taste of them, they get it. It's mostly in the mindset I think & since I tend to push the envelope a bit, I go through it with my own husband! 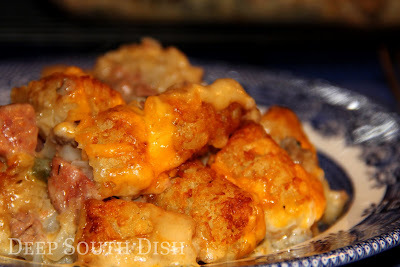 I love the Tator Tot Casserole, but am anxious to try this with the meat added to it. I, too, am a Mississippi girl transplanted in NC now. My sister shared this site with me, and I'm so glad she did. (P.S. Would LOVE to win a cookbook). Hi Lorelei and welcome!! It's very good with the meat added & makes it more of a main dish kind of meal. Hope you enjoy the website!! It you try it, let me know what you think of the difference Vickie! Oh yes, those wonderful lovely starches!! It's a nice occasional treat & everybody seems to really love it Belinda - enjoy! I make this when we're low on food in the house which isn't often but when I do make it my fiance LOVES it!! It's a nice addition, for that very reason! The family loved this!! I used Deer and Elk burger, and the smoked sausage was really good in it. Will definately be making this again!! Glad you enjoyed it - thanks for letting me know! You know I use sour cream in the hashbrown casserole but not in this one. I can't imagine that it's not a great addition! I came home from work tonight as was so hungry for Tater Tot casserole as I had some in the freezer. A Google search led me to your recipe. I made it substituting regular onions and red peppers as this is all I had in the house and also added green beans. It turned out delicious. Hubby and I ate it all. I would make this again. I'm so glad you enjoyed it - thank you for taking the time to come back and let me know! Excellent! I must confess that I changed the recipe just a little. I used Italian sausage instead of smoked sausage. If I were back home in Louisiana I'd have followed the recipe precisely. However there aren't any good smoked sausages to choose from up here in the St. Louis area, unless you consider Hillshire Farms smoked sausage good. haha Great job! We'll certainly be having this meal again. I just want to let you know that I made this last night and it was awesome. My husband actually went back for thirds. I was out of garlic so I had to omit that and I also didn't have any smoked sausage on hand. However, it was still out of this world good and I know we'll be making it again. Thank you so much for the recipe (actually all your recipes -- I've been seriously devouring your site lately!). Will be pinning this one to my board on Pinterest. Thanks so much Anna! I'm glad y'all enjoyed the dish & I really appreciate you coming by to let me know! I'm from "up North" (MN to be exact) and Tater Tot Hotdish is a standard up there! We add frozen mixed vegetables with the meat and soup, then the tater tots on top. Any potluck, funeral, etc that you go to up there you can be assured there will be Tater Tot Hotdish! Always reminds me of my Grandma! Thanks for sharing! I've noticed that hot dish and casserole are pretty much the same thing - just different names from different regions of the country. We all may have more in common than we realize! You're welcome Jessica - hope y'all enjoy it! I'm making this tater tot casserole tonight, thank you. It really sound good. Mary, This looks wonderful. My wife loves casseroles and I love different twists on food. I just have to get her past the sausage thing. I can’t do the hot ‘n spicy sausage. I’m Irish. My palate will go ‘flambé’ in a heartbeat. You turned me on to Conecuh Sausage a while back. I absolutely love its flavor, texture and quality. It’s some of the best sausage I’ve had since leaving NY. I like it when I cut open a sausage and I can recognize the ingredients; and it’s not all ‘pink slime’ or mush, and tastes like a salty hot dog. I wish I could find Savoie's. It sounds pretty good. Mary’s idea of sausage is Johnsonville and Hillshire Farms. Oh Lord forgive her, for she knows not what she does. Oh mercy Chris, you got me giggling over here! That Conecuh is good stuff isn't it? what kind of smoked sausage did you use? Hey Diane! You can use any kind of smoked sausage you l like with this. We lean more toward a spicy one or some kind of andouille most times, but a basic smoked sausage will work. I used Savoie's 7-links spicy hot smoked sausage when I wrote this, so I eliminated the Cajun seasoning but added in 1/4 teaspoon of garlic powder. Do you have a good steak fajitas recipe? Unfortunately, I haven't written one yet, though I personally love them. My silly husband only wants the meat and none of the veggies though, so I'll have to double or triple the meat portion. I'm sure I'll get to it one day though! This is what's for dinner tonight!!! I've had this casserole before but not with the sausage added. We ate this tonight with the addition of the sausage and it just put it over the top! I doubled for a 9x13 and it was perfect. I love the Slap Ya Momma seasonings in it too with the bell pepper, it was delicious! We can't wait to make this one again soon. This will especially be a good dinner for us once this school year gets rolling again! Thank you for another fabulous dinner!! !